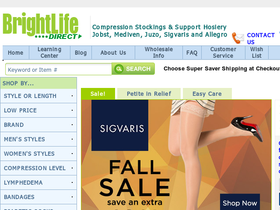 BrightLife Direct, online at brightlifedirect.com, is the ultimate place to go for medical compression garments. Compression garments are medical clothing specifically sized to give comfort during areas of pain and BrightLife Direct offers them at unbeatable prices. BrightLife Direct has top brands such as Allegro, Solaris, BiaCare, SockWell, Mr. Comfort, and more. Not only does BrightLife Direct have compression stockings and hosiery, but they also have shoes, bandages, diabetic socks, braces, gloves, lotion, and much more. Visit RetailSteal.com for the latest BrightLife Direct discounts, BrightLife Direct coupon codes, and BrightLife Direct promo codes. Shop online at Brightlife Direct and enjoy up to 50% off a great selection of clearance items. Shop at brightlifedirect.com and enjoy free super saver shipping on any order. Use this promo code at brightlifedirect.com and save 10% on any Sigvaris item. Shop at brightlifedirect.com and save up to 40% off Ambra Le Roy roll gauze. Shop at brightlifedirect.com and save $25.96 on men's Dr. Comfort relax therapeutic slippers. Save 10% and receive free shipping on your BrightLife Direct purchase when you use this coupon code!